A group of youths petrol bombed Pakistani immigrants while they slept in the area of Agioi Anargyroi. 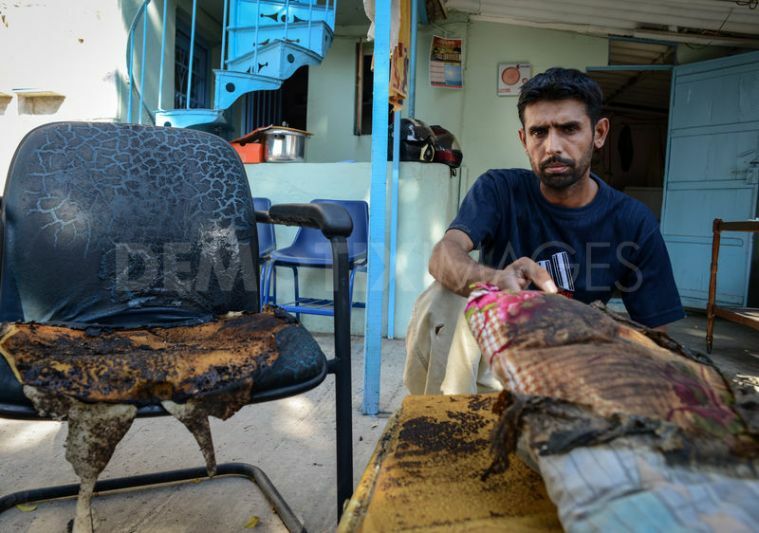 One Pakistani is hospitalized with severe burns. Attacks against immigrants in the region continue. 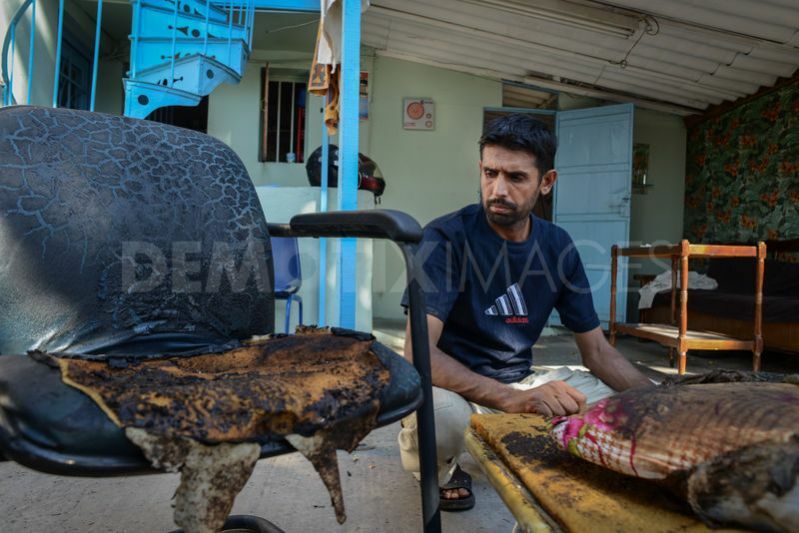 Fesel shows the bed that Navid was sleeping in, who was burned when attacked. The old Greek traditional courtyard with the well, where Pakistanis live, as seen between the leaves of the olive tree that were burnt from the attack. 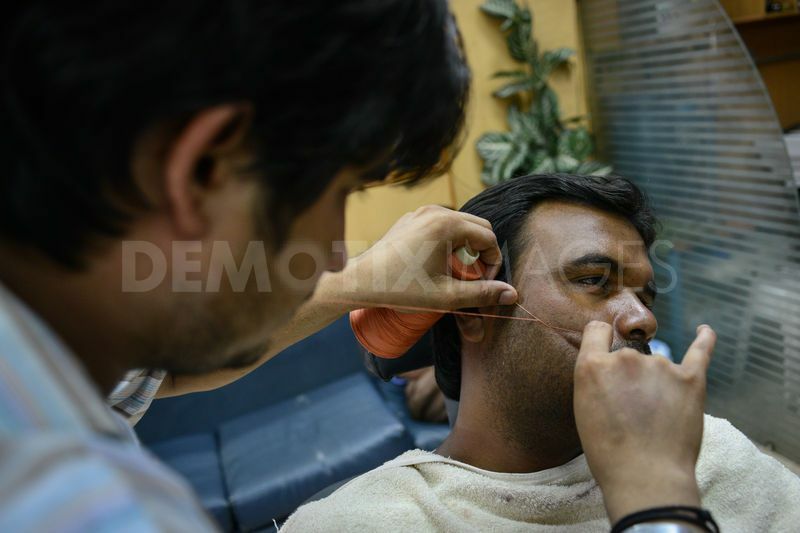 Majid, another Pakistani victim of racist attack, while working as a barber..
Majid, another Pakistani victim of racist attack, while threading facial hair as a barber. 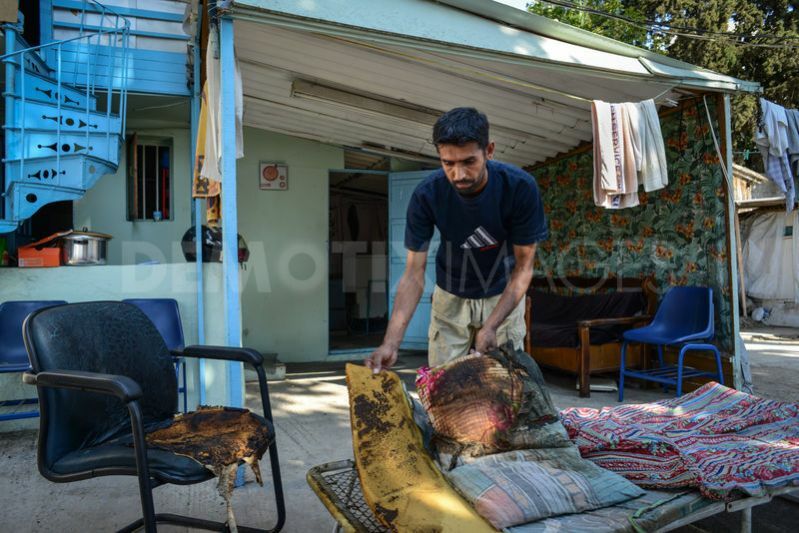 A group of youths attacked with Petrol bomb to Pakistani immigrants while they slept in the yard of their home at dawn Sunday in the area of Agioi Anargyroi in Athens. 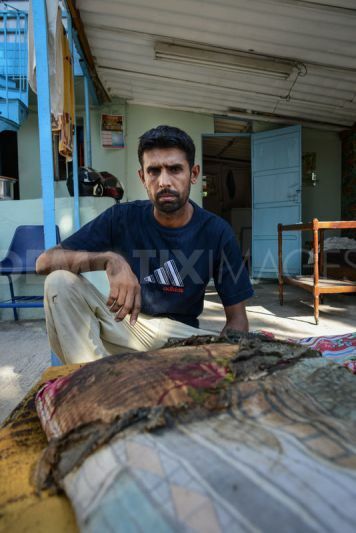 One Pakistani of the victims, is hospitalized in a special monitoring unit, with severe burns on his back and hand. The attacks against immigrants in the region continue. Victims of the attacks are photographed and tell their experience. The facts are also denounced officially by the movement “United Against Racism and Fascist Threat” and the “Union of Migrant Workers”. A month ago in the same region of Agioi Anargyroi, another petrol bomb attack had happened, to a place of prayer of Pakistani Muslims. 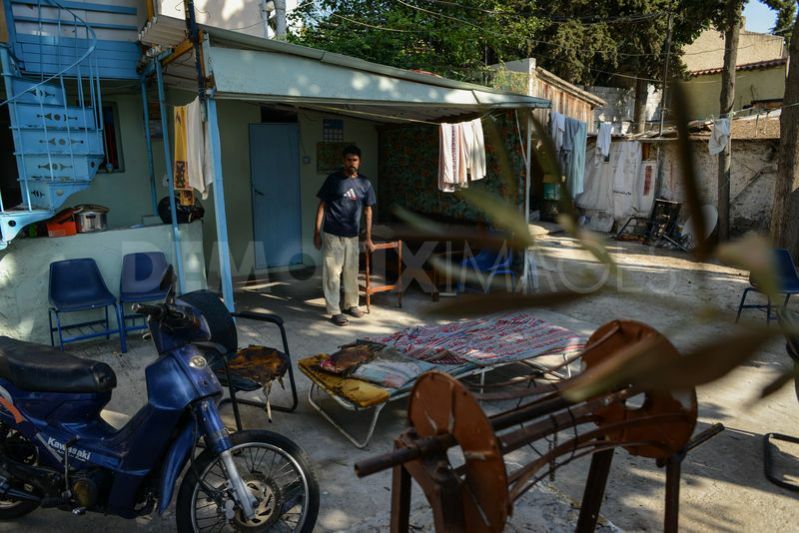 “ We live in this home for the last ten years with Navid Navaz who is 37 years old and has Residence and Work Permit in Greece since 1998. At dawn on Sunday I was sleeping and Navid was sleping on this bed here in the courtyard because of the hot weather. Suddenly in the night we heard an explosion and Navid woke up to discover that his bed and clothes were on fire, while he was full of burning petroleum. Navid was transferred to the hospital and doctors said he has to stay isolated in a special monitoring unit due to the severity of burns. His left arm and back are much burned. Policemen of Agioi Anargyroi Police Department came here after they were called by our neighbours. After a while more Policemen came here from the neighboring Police Department of Ilion municipality. I heard them saying that the explosion was heard in Ilion and they came to see what has happened. Police left after they picked up pieces of the bottle that was used for the petrol bomb. I meet Nasser who is a relative of Fesel and Navid and he lives in Greece for the last 17 years. He tells me: “Fesel and Navid are very quiet people and have never bothered anyone. I have many Greeks friends who heard what happened and called me on the phone to tell me they feel sorry. Such events would not occur in the previously years. Before 24 hours go through, on the same street that Fesel and Navid live, another Pakistani named Majid was attacked with sticks by a group of young people riding motorcycles. 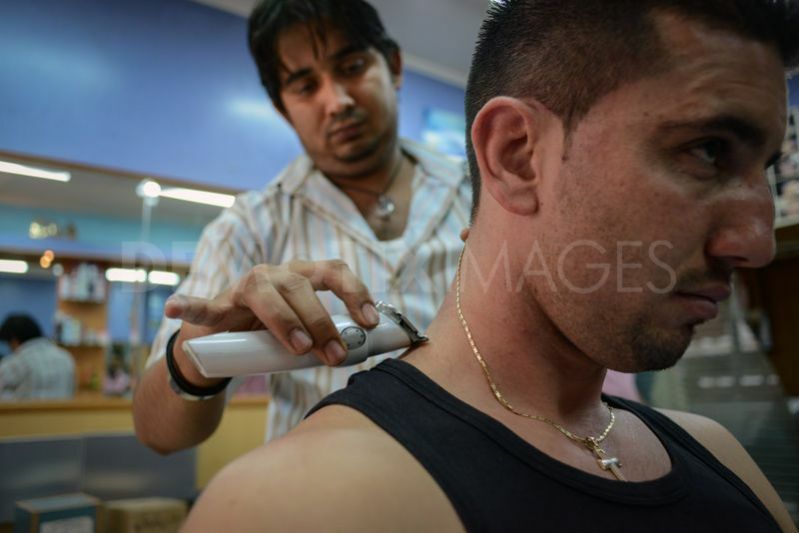 Majid is 24 years old and working as a barber on the area and lives nearly a hundred meters away from the home that was attacked with petrol bomb. 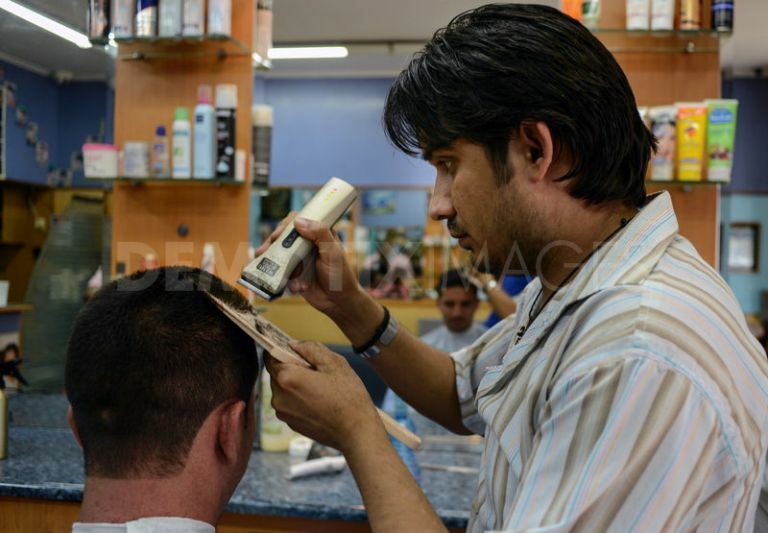 I meet Majid on the hairdresser's, where he works. He is a very pleasant guy, subsequently smiling. 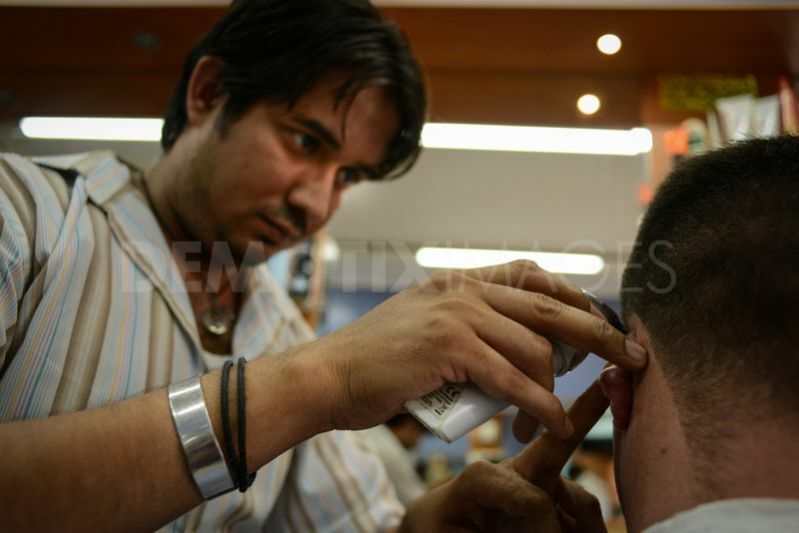 On the hairdresser's are men and women clients. “ On Sunday around 11am, I was walking on the street out of my home with two other friends. Suddenly we were encircled by a group of men on ten bikes that were holding sticks and bats. The other two of my friends managed to escape, but I could not. They were hitting me while I was down on the street for eight minutes, while shouting at me to go away from their country. The inhabitants of the surrounding houses saw this and started shouting at them, telling them to leave me go. I have bruises on my arms and back. The police came to my home after two hours and recorded what happened. Now I'm afraid to go out, that I might get stabbed. I have seen from afar some of those who beat me, they live nearby. While I speak with Majid, I also get known with Maria, a Greek lady around 50 y.o., who came to dye her hair at the hairdresser. She is a pharmacist. “ I have also seen at least two times, the group with motorcycles that beats immigrants. One day at dawn Tuesday or Wednesday, they attacked to three migrants, who were looking in the trash for recyclables. Migrants were chased and walked into a bus. But their attackers walked into the bus and continued beating them. The bus driver did nothing. He stared and laughed. All this is done because Greece accepted poor and miserable people, but we have no infrastructure. If the rich of this earth, gave a tenth of their earnings, no one would be hungry anymore, and migrants would not have to leave their countries.